In my last student loan progress update for March, I had mentioned that there would be some big news but that it was good news. 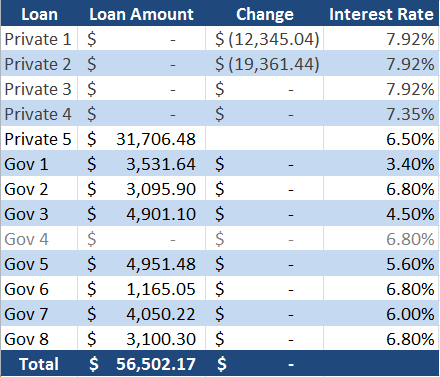 You might have also wondered why I decided to put the bulk of my money into my government student loans which only have an interest rate of 6.8% instead of my private loans which have an interest rate of 7.92%, especially because I was using the avalanche method to pay off my student loans. The reason for that is because my private student loans are no longer at an interest rate of 7.92%! I have been able to refinance them through Citizens Bank to lower my interest rate from 7.92% down to 6.5%, which is really awesome and probably some of the best news relating my student loans in a while. I had looked into several other banks and had even applied to a few others, but I received the best offer and what seemed like the best bet from Citizens Bank. I could have went with a variable rate loan that would have started out at even lower interest rate, but I decided to stay away from that because you never know what the future might bring. Instead, I will be able to lower my minimum monthly payment even sooner by getting rid of all the 6.8% interest government loans before I move back to taking on my private loans which are now at a 6.5% interest rate. This is awesome news, and depending on how long it takes to pay off my loans this should save me a decent amount of money. If I end up moving out and slowing down my loan repayments, I will save even more money in the long run instead of wasting it on interest. If you remember from my post at the beginning of the year, I was debating on using the snowball method of paying back debt versus the avalanche method for exactly that reason. Now I will be able to lower my monthly payments much quicker and not lose out on any efficiency, because some of my government student loans are actually at a higher interest rate. It would have been nice if my interest rate was even lower, but this is still a nice break. I’ve already paid off Gov Loan #4 last month, and I’m on track to pay off Gov Loan #6 next month. Taking out all of the 6.8% interest loans will reduce my minimum monthly payments by $134, not bad since they currently are at $816! If I did happen to have an emergency this helps to provide more cash flow and flexibility when I needed it. 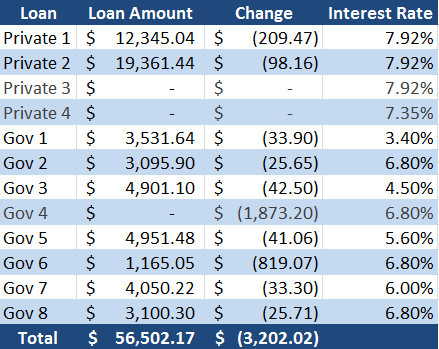 The only “negative” thing about this loan is that it is now financed as a 15 year loan, which isn’t the worst thing. Obviously my minimum payments in general have dropped but I will continue to pay this loan as if it was a 10 year loan, putting around $500 a month towards the loan as the minimum. Obviously my plan is to pay this off even faster than 10 years, but while I focus on those few government loans that is what I’ll be doing. The point of refinancing this loan was to save money in the short run and long run, not have to pay more total in the long run! If you ever refinance a loan for a lower interest rate over a longer pay period, just remember that you might not actually be saving money in the long run if you are only using the minimum payment. This is some of the best news I’ve had about my student loans in a long time, and if it saves me “only” a few hundred dollars it will definitely be worth it. Other than having to scan and send a few documents, fill out an application, and send a few e-mails it really wasn’t that much effort. And there were absolutely no fees, this process was completely free! Overall this was pretty painless and a rewarding experience, even if for just the small psychological victory. 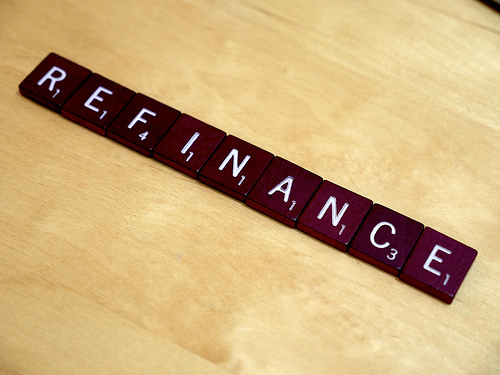 Nice work on the refinancing! I don’t blame you for not going with the variable rate, you really don’t know what will happen in the future. Congrats on paying #4 off, and it’s great that you’ll have #6 paid off next month. That must be extra motivating! Thank you! I will probably pay off the loans before interest rates really start to move up, but you never know. I’d rather go with the safe bet here. And yes it’s very exciting to finally start to see the loans drop off. If only the total amount remaining wasn’t so large and that could really start disappearing.